Absolutely awesome plane Dean, and everyone involved. The modelling, texturing, flight dynamics, sounds, are all superb. I am having a bit of trouble keeping it straight during takeoff and landing, but I'm pretty sure that's pilot error . Thanks very much for an awesome aircraft. It can take me upwards of thirty seconds to go from stand still to full throttle because i'm constantly moving each throttle back and forth keeping the plane as straight as I can on the runway. Persnickety engines dont help either, but gortunately a restart doesnt take long, when keeping it straight is impossible.. I just saw your post above mine regarding the takeoff and landing, I somehow missed it before. I probably had the page open as I was posting and it didn't refresh. I will give the engine restart a go. Unfortunately I am not set up with separate throttle levers. Although I do have a Warthog controller, I use the spare two levers for mixture and prop control. I often think separate throttles would come in handy. I assume you did the flight dynamics Pam. Absolutely awesome job. I really love the way this plane flies. You're welcome Scott, glad you're enjoying it! Thanks Scott.. Yeahh, I and Paul Frimston started working on this FDE in 2010, We worked on it for five years, and then my health got too bad to continue with the schedule i had set for myself.. Paul's now making his own mark in the flight sim world as a flight dynamicist and doing a great job of it.. This FDE taught us more thsn we could possibly imagine back then, and its such a delight seeing it being enjoyed. for authentic looking P61 type gauges. You will need the NOSA gauges that huub mentions in post # 47. Milton's ST_Lodestar which will give you the radio altimeter. And the center piece, a very good Sperry gyro unit from Roy Chaffin and company. You will need his B25, a very good aircraft in its own rights. You will see the differences in the screen shots. Two panel.cfg are included depending on which version you go with, DC3 or RCS. Last edited by Seahawk72s; August 9th, 2018 at 07:31. If you are experiencing the aircraft pulling hard to either the left of the right on takeoff, turn the engines off and do a manual restart. 4. apply gas and click the left starter switch. If it doesnt start, apply more gas. 5. repeat #4 for the right starter. 7. keep an eye on oil and CHT temps. 9. smoothly and slowly apply more throttle till you reach take off speed and power. These engines are cantankerous and finnicky. They like to be babied.. Do not simply slam the throttles to the wall and expect things to go well.. A slow steady hand and an observant eye will take you a long way to enjoying your experience more..
#9 is the key! On my first takeoff [attempt] I drove the beastie off the runway, into the grass, through the woods and into a barn. "What the heck is wrong with this airplane?" thought I, lol. Of course I did slam the throttles full forward when lined up. Did a few more experiments, and sort of figured out Item #9 above by myself, through trial and error and a few runway signs. Once in the air it was a joy to fly. Love the speed brakes. She sure doesn't want to slow down... Landing was not too difficult, but once on the ground you gotta be careful, lest you drive off into the bushes again. Very fun plane. Thanks to all who helped bring this beautiful ship to life! Now that my aircraft is behaving normally, It did have the tendency for a left pull but with Pam's instructions, it's much easier to keep 'er on the runway. I also added a little more pizazz to my brakes. Thanks Dean for a beautiful black beast. Downloaded yesterday and did some flights around my Morotai (WIP) and I must say she handles beautifully and is simply gorgeous. She is a welcome addition to my hangar! Great job! ::LOL:: It IS a bit like trying to stop a freight train isnt it?? During WWII Johnny Meyers landed a P-61B at 200mph.. it took him two miles to stop..
What amazes me is they didnt blow the tires or struts..
the 104 is interesting too.. Nasa used to use them and regularly took them up too 118000 feet. thats a whole lot higher than the published altitude for the sr-71. amazing plane..
All successful landings in the last several attempts. One at L08 (5,000 foot runway) and this morning at Santa Barbra Municipal Airport. She seems to slow nicely with intermittent air brake and proper flaps. Finally deploying air brakes at touchdown and gentle pressure on the brakes. Great panels! I do miss the 3D bezels though as they gave such depth to the cockpit in the Reporter. When I start work on the RF-8 Crusader in a couple of weeks, I'll have the 3D bezels back but with a new set up so that both preferences are covered ( 3D cockpit, ability to alter instruments with ease ). Absolutely beautiful plane Dean and company. I did not find this in the P3D download section. Is it P3D compatible? Still flying good! Has anyone tried the autopilot? I found that it will hold any heading perfectly but will not come close to holding altitude. I've copied and pasted into the aircraft.cfg the [altimeters] from another aircraft but still no luck. I've tried using my own Autopilot with another [autopilot] section with no luck. Ctrl+z won't hold it. I'm not sure I could get the heading to hold either. I've been flying mostly VFR in real time weather so I thought I'd try it to see if it would hold me steady when it got breezy up near KBVS, which is my home base in the sim. Thanks for the reply. Once you click on the knob for A/P or hit the z button, turning the knob on the A/P compass should make the aircraft turn and hold wherever you set it. Make sure the little light is on. Once I/We get the altitude hold working, it should be a comfortable plane for longer duration flights. No problems here. I did do away with the antique radio and made my own radio setup with the Collins radios and an autopilot from the AlphaSim B-57, (no changes were made to autopilot section in the aircraft.cfg file). I took off from Nantucket heading for Dover AFB on a hdg of 260. . .Altitude of 3000'(Following GPS track). . .as I was passing Marthas Vineyard I set a hdg of 040, switched from NAV to HDG on the autopilot and the Blackwidow turned to the new heading, maintaining the correct altitude. NOTE: I always hit the "B" key and "D" key to ensure that the correct altimeter and compass headings are set. If those don't update as they should, altitudes and hdg's can be buggy as the AP is trying to compensate for incorrect information. Thanks! I'll try the B and D key on the next flight. 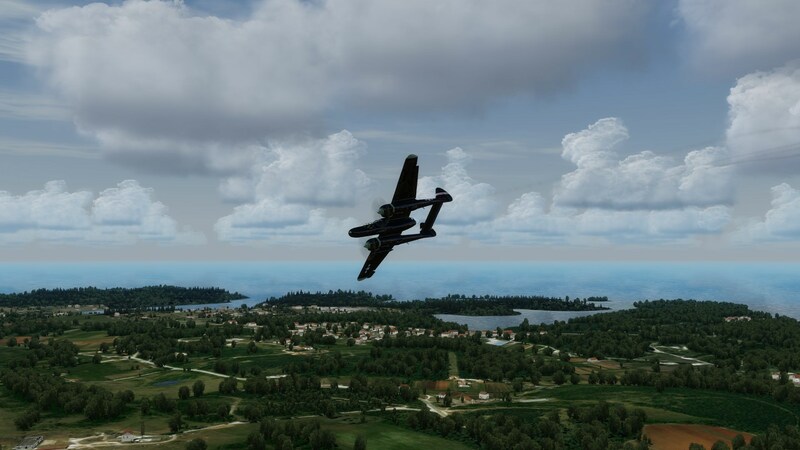 Thanks so much Dean, Pam and the rest who worked so hard gifting this community of hobbyists with a long wished for version of the widow for FSX. It's a beauty. So hurried was I to fly that I took off, circled around and landed safely without flaps or speed brakes. Nice handling for such a beast. Very good modelling, Nice FDE Pam, but I'm suffering from jitters on the deck & prop rotation with everything switched off. Take off OK, but almost no rudder effect on ground or in flight, & also get jitters in level flight. Cannot understand why one must pull pitch lever back at about 300 mph as well as throttle, AFSD shows prop pitch about 23 degrees at 300 mph & not much more at 400 mph - & then advance again to get through the brick wall - got it to 400 mph. Landed OK full flaps etc & spoiler, then switched off engines using M-, props stopped then reversed direction. Did notice the the dirt throws up about 18" aft of each wheel. So jitters might be two things, 1) incorrect contact points, but 2) more likely to be MoI related as noticed in aircraft cfg a very, very large yaw value compared to the pitch value. I don't like to denigrate your work Pam as I know from experience how difficult FDE can be, so please take this as positive criticism. BTW I got jitters on an addon Biggin Hill as well as standard Heathrow using FSX SP2. Nice to know that I am not the only one with a jittery aircraft in a cold and dark state. Pam did wonders for mine! Only slightly nervous props now. let me check through those MOI's... Its been years since i looked at them.. I'm a little on the ragged edge this morning... Bear with me. My emphysema has kicked in full and theres a lot of chest pain and i cant get my breath and i can hardly think. A few days ago, i had an episode where i couldnt figure out how to open up a new window tab in firefox. My life is changing and i'm breaking down, slowly. Life does that. Life of all kinds.. Software life is life..
Charlie, your running acceleration on Win XP. Jim, your running SP2.. I developed this FDE, with Accel, SP2, SE, and P3D, and it wasnt all at once. Like I boasted so brazenly: the FDE was special. It was started in 2010 and was worked on 18 hours a day, seven days a week, till 2013 when i burned out and parted with flying. Like i said, i did this fde in p3dV4 Thats because thats what i have on my computer. It's not even P3D. It's P3DV4!. Its a completely different animal from what it started out as. Still looks like FSX though.. The point i'm trying to make though is that the world changes. We can try and slow it down, but we're just fooling ourselves. You keep up, or it leaves you behind. Just like it's leaving me behind now because my body can no longer, keep up. Thats life.. We woul;d all like a magic blue pill that keeps us able to live in out matrixed fantasies of our nearly not so perfect worlds. You want me to support a program thjat hasnt been around in a very long time. You want me to support several programs that havent been around in a very long time, and an operating system that is all but extinct. I'm running a Ryzen 5 with six hard cores, six virtual cores, twelve threads, full virtualization as well and sixteen gigs of ddr4 ram pumping at 3200 mhz while running the absolute latest version of big brother windows 10 there is. Life has come a very long way from that little two core intel one point two ghz cpu that fsx was designed to run on. I'll do my best to make this work for you folks, just as I always do, But really folks, it may be slow, but I'm dieing, and once i'm gone, I wont be there fore you or me or anyone any more. You need to learn to advance with the times before the times leave you behind, and your left with nothing. I love you all.. Just bear with me. Today's a little rough..
heheheh 2011. same fde. there were no jitters then.. Enjoy..